The Grand Duke Alexis Mikhailovich (1875 - 1895) was the son of Grand Duke Michael, Governor of The Caucasus, and Grand Duchess Olga Fedorovna. 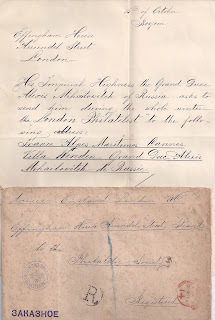 This is a letter from his Secretary (I guess), addressed to the Philatelic Society (forerunner of the Royal Philatelic Society of London) and publisher then (as now) of The London Philatelist. 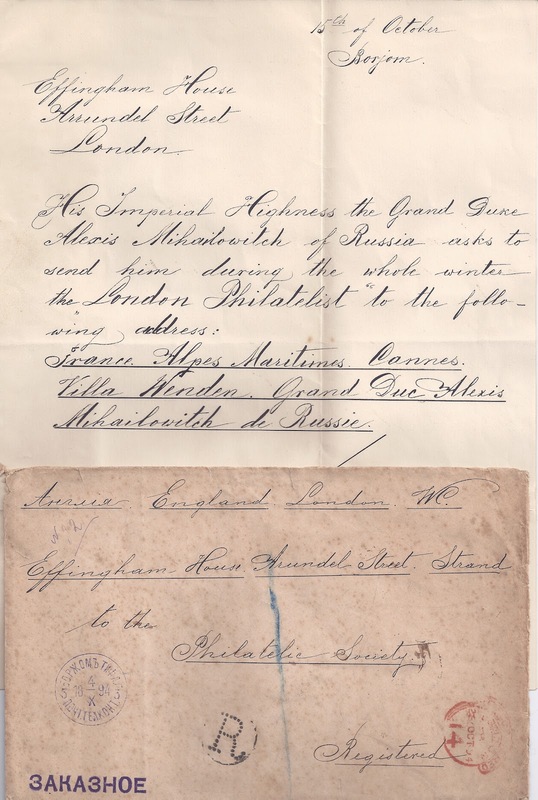 The Letter was sent from BORZHOM TIFL G. 4 X 1894, franked with 3 x 10 kopeck adhesives on the reverse [ second weight step] and was received in London on 25 October 1894. Alexis died in 1895 from tuberculosis.